Strategic planning and the right tools can keep your department running smoothly. In an effort to improve the efficiency of their department's workflow and/or meet the challenges that continually threaten it, radiology department heads who face requirements to be efficient while also maximizing quality may jump to decisions that are unwise. One would be to run out and buy software as a quick fix, says Paul Chang, MD, FSIIM, a professor and the vice chairman of radiology informatics at the University of Chicago School of Medicine and medical director of enterprise imaging and service-oriented architecture informatics at the University of Chicago Hospitals. Another would be to hire more employees and radiologists, says Evan Kaminer, MD, from Nyack Hospital in Nyack, New York. Current challenges that test the efficiency and quality of radiology workflow include 3D advanced visualization, nonradiology PACS images, multifacility coverage, and the requirement for immediate access to relevant patient EHR data. Efficiency also is impeded because today's radiology workflow engines (WFEs) are years behind those that are enabling industries outside of health care to run smoothly, say Chang and Bradley Erickson, MD, PhD, associate chair for research in radiology at Mayo Clinic in Rochester, Minnesota. 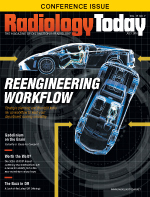 Tools such as cloud-based imaging, vendor neutral archiving, and enhancements to workflow systems such as PACS and RIS are helping radiology WFEs catch up. Yet, before making any kind of investment, Chang suggests departments take one basic step when it comes to the efficiency of their workflow: Assess and measure it. Assessing one's workflow process reveals "pain points" within the workflow process; when—and only when—a department has pinpointed its pain points should it start to seek out vendors and buy software, he adds. Pain points within a department's workflow represent areas of variability, such as variations in following up incidental findings and responding in a timely fashion, and areas that need to be improved, such as a department's throughput to clinics or a patient's length of stay. The University of Chicago has a process of assessment called the "closed loop imaging initiative," Chang says. "We found out we were pretty efficient in the reading room, but in image acquisition, where the technologists acquire the studies, we were very inefficient." Once the inefficiency was determined, Chang and members of the hospital's IT department wrote software to greatly improve the problem. "People are too quick to buy software because they think it will be the solution," Chang says. "Software alone is just a tool; you have to have a cultural change, a governance model, an analytics perspective, and some process—an ongoing continuous quality improvement process—that continuously looks at your workflow cycle." Such assessments frequently expose what Chang sees as a particularly negative impact on workflow orchestration: human involvement in areas where they are bound to make errors and introduce inefficiency. Humans should be used at the points in the process where they can meaningfully contribute and replaced in areas where computers reduce variability, he says. "In radiology, we put humans in positions where their liabilities become impactful, unfortunately, in a negative way," Chang says. "We expect humans to remember the workflow, to instantiate it, and to orchestrate it, yet we are terrible at remembering things. Computers are usually better at these tasks, freeing humans to concentrate on what we do best." Using computers to do jobs done inefficiently by humans, including radiologists, does not mean radiologists and technologists will be replaced, Chang emphasizes. "It is not about replacing humans; it is about augmenting and supporting us and letting computers do the 'busy work,'" he stresses. "Radiologists are best at things like showing judgment in complex situations. They are also good at synthesizing things in a way that other people understand; machines cannot do that well, at least not yet." Another common downfall that can result when humans are made responsible for instantiating the workflow is the frequent dependency on the person or persons staffers come to rely on to keep things running smoothly. "This is the chief technologist in the IR suite or the CT suite, who has all of the rules in his/her head, so we depend on him/her to instantiate and orchestrate the workflow," Chang explains. "Here's the problem: When [this person] is not there, the day runs terribly." Humans also can make errors during dictation, when they are entering data as part of the workflow process, Kaminer adds. "While voice recognition has had a significant improvement in our productivity, we are struggling to include more and more detailed data into our reports," he says. "Moving this data from modality to report has so far been mostly a tedious manual process requiring radiologists to dictate complicated numbers into tables, for example, CT dose/injection information, [fetal] biometry, or bone densitometry measurements. This is not the most efficient use of our time and can lead to errors." Improving the automated inclusion of data into the report workflow is "high on the priority list" at Nyack Hospital, Kaminer says. Automating this step is becoming essential, he adds, since the government is expected to release regulations that will increase the data documentation requirements for radiology reports. The lack of deep interoperability can sabotage the efficiency of the EHR, PACS, and RIS because humans are required to verbally and/or manually "cut and paste" data from one system to another, which can result in quality variability and inefficiency, Chang notes. Yet human error is not all to blame for inefficiency; the systems within the process can be at fault. Erickson believes PACS and RIS need an overhaul. "I think PACS and RIS are long overdue for a rework to facilitate and encourage more complex workflows," Erickson says. "Radiology systems like PACS and RIS have been built assuming a linear workflow: modality to PACS/RIS to archive. Problems arise when there are 'side lobes' of workflow like a 3D lab or computer-aided detection that is not integrated into PACS. Multifacility coverage also can result in nonlinear workflows, and that is also a challenge." On a grander scale, Erickson and Chang believe radiology—as well as health care as a whole—deserves a WFE that works as efficiently as those being used in industries outside of health care. Industries such as manufacturing and sales have developed WFEs that can describe workflows either as text or graphically and then deploy, Erickson explains. "The WFEs then help to execute the workflow and to assure that steps that cannot be automated adhere to the designed workflow," Erickson says. "They can also assist in troubleshooting in that they recognize when steps or tasks do not complete in a specified amount of time and can then begin the specified escalation process. And because all the steps are managed by the WFE, dashboards that let you see what is going on come along for free." Radiology, Erickson says, would benefit from the introduction of a commercial-grade WFE. "Commercial-grade engines have much better tools for solving problems, scaling, recovering from errors," he explains. "I am not aware of a commercial-grade, general purpose workflow engine being used in radiology. I know some vendors have written their own workflow engine, but when I query them about what it can do, the capabilities are fairly limited. The radiology workflow engines I have seen execute a vendor's special-purpose text description of workflow." Chang says radiology and health care WFEs are about 10 years behind other industries when it comes to leveraging IT, especially when it comes to workflow. "When you look at other industries outside of health care, the way they use IT is that they design workflow orchestrations and systems to mitigate the liabilities of humans. They put humans in the position to succeed and not to fail," he explains. Yet Chang believes that those on the radiology end—the WFE users—are bound to see more innovations in WFEs, since vendors are becoming more in tune to the needs on the user side rather than the IT side. "We work closely with our clients to understand their needs," says Jeanne Ehinger, marketing communication manager for Versus Technology, Inc, which was acquired by Midmark Corporation in April. These needs include matching available equipment to mobile technologists, better equipment utilization, quicker turnover of exam rooms, and improved patient flow for exams. "Our real-time locating system [RTLS] workflow and patient flow software is platform independent, so it works with both EHR- and PACS-driven workflows. We integrate with those systems to communicate relevant details regarding patients, exam schedule, order completion, and more, and display it alongside patient and technologist location and room/patient status to improve situational awareness around the operational process of care delivery." Ehinger says the Versus Advantages Clinic system improves patient flow in radiology exam settings by assigning locating badges to patients and staff. "As radiologic technologists go about their daily work, our system monitors the location of the badges, which determines the status of exam rooms and monitors interactions between technologists and patients. Through intelligent business rules, we automatically communicate room status [available, occupied, in need of turnover] and patient status [alone time, overall length of stay, who is with the patient, and who needs to see them next]," she explains. "The result is a more productive workday, removing nonvalue-added wasted time, increasing capacity, and improving the patient experience due to lowering wait times." On the inpatient side, hospitals, including Johns Hopkins, have used RTLS data to monitor the location of mobile radiology equipment and technologists, Ehinger says. "By detecting when equipment and technologists are together in the same room, we can communicate whether equipment is in use. As technologists are looking for equipment, they can easily locate the closest available machines to the patient's room." Kaminer is using products made by McKesson Corporation to address workflow. The company's Conserus Workflow Intelligence has enabled Nyack Hospital's radiology department to prioritize exams, which, he says, is especially useful in an age when just about every patient's care includes radiology. Such an influx may trigger some departments to hire more radiologists or employees, yet prioritizing exams offers a better solution, he notes. "We use Conserus Workflow Intelligence to prioritize the radiologist reading list so that we read the most important exams first. These exams may be marked high priority because of the severity of patient illness, patient location [emergency department or ICU], or referrer request," Kaminer explains. The department has decreased its reporting time for ICU patients by 61% and for [emergency department] patients by 38%. Kaminer adds that his department plans to implement Conserus Imaging Fellow, which the company touts as "a new solution that connects relevant patient information from the EHR with imaging information, all within the radiologist's regular diagnostic workflow." This technology mines data from non-PACS sources, such as the hospital EHR, and provides the interpreting radiologist with real-time information about the patient. Erickson is currently working on bringing his in-house system to market; the system has improved the processing of 3D and low-dose CT exams. "The in-house system we developed has substantially improved efficiency. We have documented that for some 3D lab-type functions. [The system] recognized many more cases for processing, which both increases efficiency by reducing radiologist waiting time and increases revenue by assuring more cases are properly processed as 3D cases," Erickson says. "It also assures proper processing of low-dose CT examinations, again reducing radiologist wait time and improving quality of care." Chang and his partners in IT have built software to automatically transfer PACS data into the appropriate workflow orchestration database. For example, cancer lesion measurements are automatically transferred electronically to the oncologists' database and dashboard, as soon as they are created in the PACS. The software then alerts radiologists to current recommendations that are relative to a particular case. It also flags and prioritizes studies. "This can have a great positive impact on enterprise priorities, such as outpatient efficiency and inpatient length of stay," Chang says. As far as bringing any of the software to market, he says: "While our primary job at the University of Chicago is to innovate to solve our real world issues and to publish our experiences, we are collaborating with our vendor partners to allow transfer of these ideas to the market." Radiologists looking for a more efficient means of image storage, exchange, and access are finding solutions in cloud-based imaging, according to Rasu B. Shrestha, MD, MBA, chief innovation officer at the University of Pittsburgh Medical Center and executive vice president of UPMC Enterprises. Cloud-based imaging also can process massive amounts of data, including data from 3D imaging. "Image and image-related content storage is a prime area for cloud technologies to make a dent," Shrestha notes. "Compared to traditional storage methodologies, cloud-based image storage offers multiple advantages, including eliminating redundancy and providing, essentially, a single point of access to imaging content from the EHR, HIE [health information exchange], or even patient portals and mobile apps." Cloud-based imaging also is being utilized with vendor neutral archiving to develop cloud-based image exchange workflows. "As we contemplate distributed strategies vs the need to logically manage assets across the enterprise, we see cloud technologies enabling a much more streamlined methodology for handling imaging studies from disparate locations," Shrestha explains. "Cloud-based imaging has the capabilities to make image exchange as easy as social networking—so we can confer on patient cases, send messages as easily as sharing content, invite collaborators, and join networks. There is a clear recognition of the need to better define the means to exchange medical images and associated reports, whether within hospitals, across various provider locations [for example, trauma center, transplant center, cancer center, and radiology], or across a wider health information exchange." Shrestha also points out cloud-based imaging's ability to leverage computation capabilities and batch process algorithms on large volume sets "across literally anywhere. Cloud empowers anywhere access to 3D views, across a growing array of devices, and enables a radiologist to collaborate with a vascular surgeon as she's planning for a surgical intervention. Radiologists need to be more than mere diagnosticians; they need to be physician consultants. Technology is enabling this today." Overall, "cloud-based imaging allows for us to leverage the power of cloud computing to massively enhance our imaging workflow, capabilities, and value," Shrestha notes. "In this era of distributed digital imaging, there are specific and critical needs for clinicians to have the ability not just to access images at the point of care but also to be able to work efficiently and effectively from multiple locations—with full access to the complete imaging data sets, relevant priors, relevant clinical information—as well as to the right set of diagnostic tools, from any location. After all, it is all about the clinical workflow."